A clear and concise overview - direct from PSMJ’s A/E industry experts – on what it really takes to open and grow a branch office. Is it worth the risk? As an A/E firm principal, you’ve probably asked yourself this question dozens of times. And in no business is risk more apparent than in the opening, closing, and management of branch offices. How do you know when it’s the right time to open a branch … or close one? How sure are you that the branch won’t be stolen from under your nose … or managed poorly by an employee who places personal goals above those of the firm? And, perhaps more important, once a branch is up and running, how do you prevent a loss of focus? Of clients? Of money? Or worse… of people?! These are complex challenges that require keen risk assessment coupled with proven solutions. 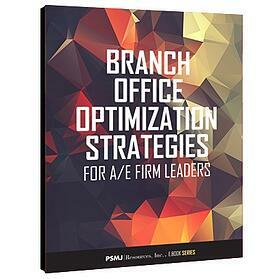 From opening and valuing your branch to managing staff and business development, this is your go-to guide for branch office management solutions.